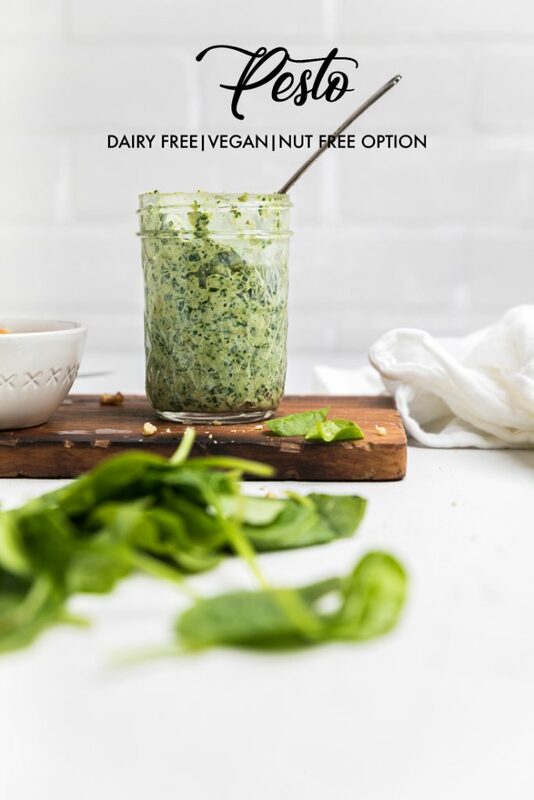 This delicious and super easy spinach and walnut dairy free pesto is one of the most versatile sauces that you need! It’s also a completely vegan pesto recipe. Just 8 ingredients, gluten free & absolutely delicious. One of the hardest parts about being dairy free (and/or vegan, plant based, other allergen insert here) is that you can’t enjoy some of the same things you did before making the switch. If you’ve learned anything about our site in the short time that it’s been around is that we are dedicated to finding equally delicious tasting recipes. 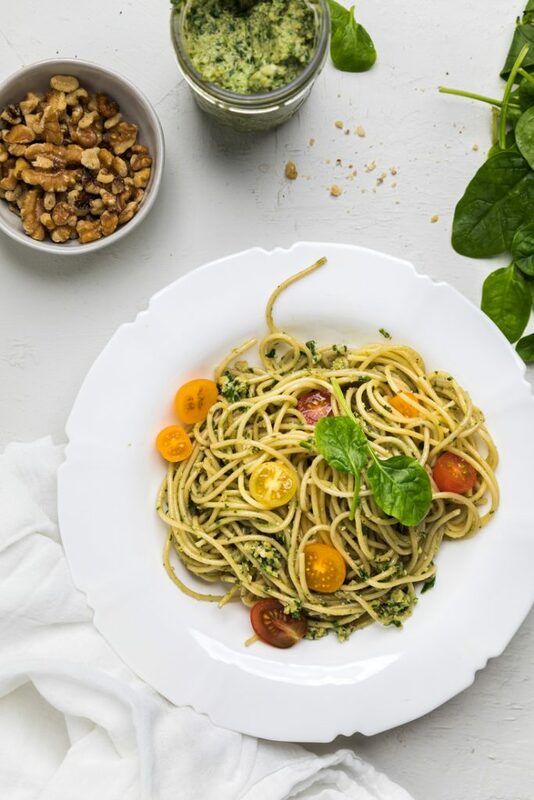 This dairy free pesto recipe hits every note of deliciousness that you love in a pesto while also being completely dairy free and a vegan pesto sauce. 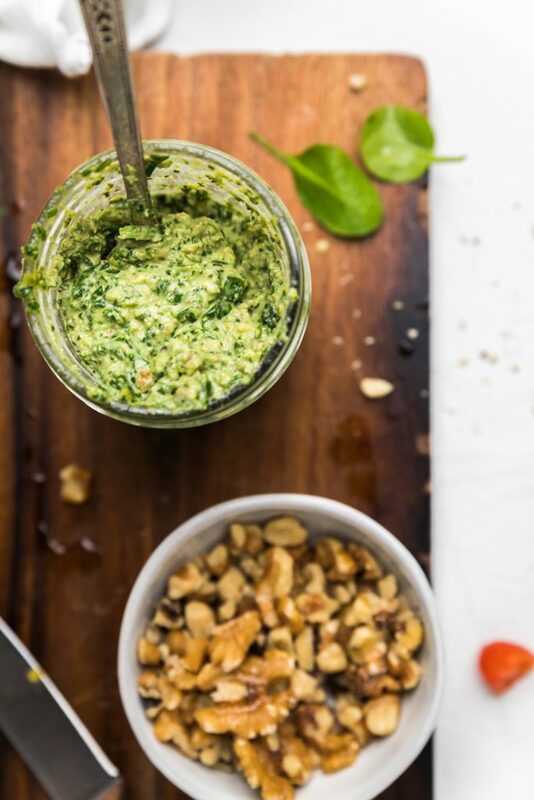 Our dairy free spinach and walnut pesto recipe has just 8 ingredients in it and comes together in just 5 minutes. You’ll need a food processor or a high powdered blender, but no other fancy type of equipment is needed. 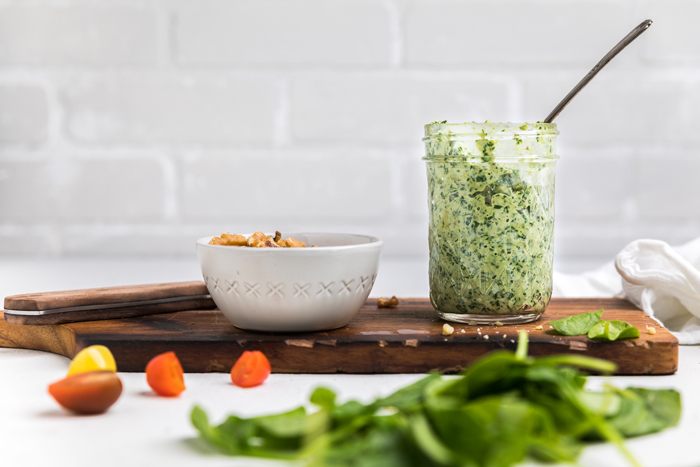 Honestly, if you had a bunch of time on your hands you could even just make this dairy free pesto with a mortar and pestle. I’ll prefer the 5 minute way though. While this is a dairy free and vegan pesto sauce, it is not nut free, therefore we can’t classify this as a Top 8 allergen friendly recipes. However, besides tree nuts, it can be allergen friendly for the rest of the top 8 allergens. 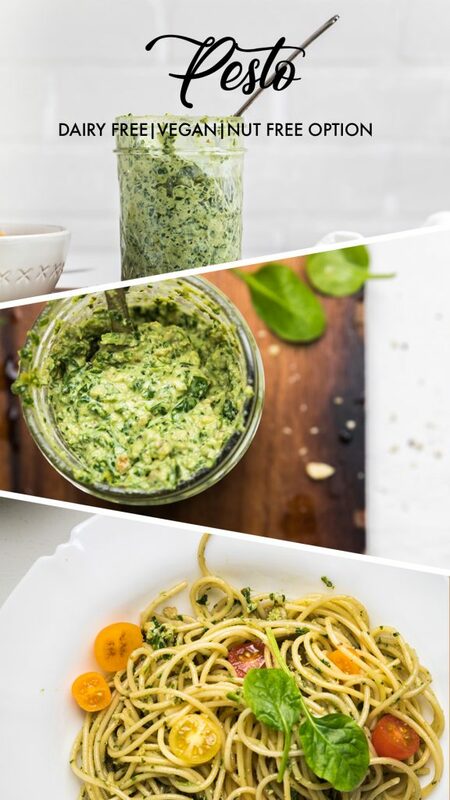 What ingredients do you need to make dairy free pesto recipe? You may or may not think that making a dairy free pesto is going to be hard or that you don’t have enough time. I’m here to tell you that you it’s not hard and you do have time to do it. If you are looking for a really quick and simple dinner idea, this one can be made in under 30 minutes. Truth. That’s just salt and pepper are included in the 8 ingredients for this dairy free pesto recipe, which means it’s insanely easy! How do you make dairy free pesto recipe? It’s always assuming to write out recipes that are insanely easy. It doesn’t seem like much of a recipe really. 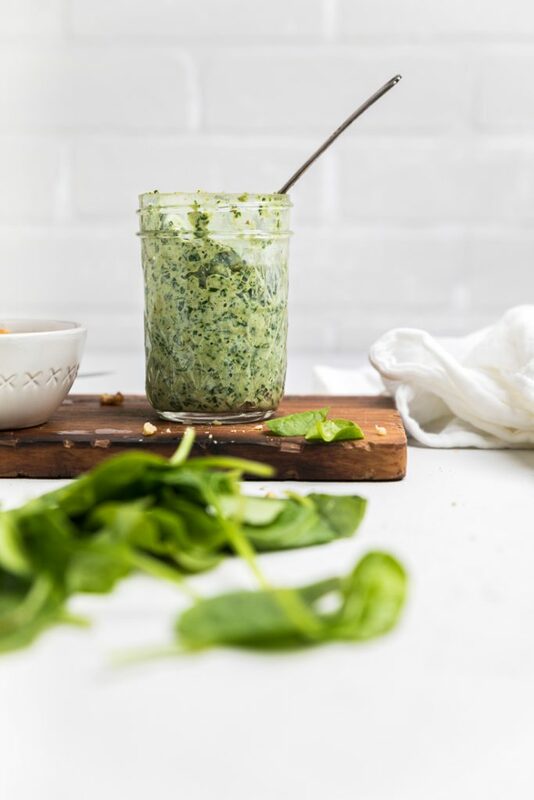 In order to make this spinach and walnut dairy free pesto recipe, you will add all your ingredients into a food processor or high powdered blender, like a Vitamix. Blend and serve. It’s that simple. 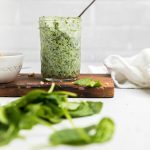 If using a food processor, you will likely need to scrape down the sides a few times in order to make sure that the spinach gets blended enough. It’s important to know that if using food processor, there will likely be some texture due to it not being able to blend it all completely. If using a blender, it gets much more smooth and creamy. Depending on your texture preferences for a dairy free pesto sauce, you may want to use one or the other. What ways can I use dairy free pesto sauce? Obviously a favorite way to use dairy free pesto is to smother it all over a delicious bowl of pasta. In the photo above we cooked pasta al dente, added the dairy free pesto sauce, and then combined it with some fresh tomatoes. It’s so simple and delicious and ready in just 15 minutes. And so many more ideas! Leave a comment and let us know your favorite way to use dairy free pesto sauce. Are you following us on social media? Be the first to see what we’re doing and finding, behind the scenes, and other get recipes are resources we’ve finding by following along. Add all your ingredients into a food processor or high powdered blender. Blend, scraping down as necessary, until desired consistency. Serve on top of pasta or other ideas listed above. Did you make this recipe? Tag us @makeitdairyfree and use #MakeItDairyFree on Social so we can feature you! Welcome to Make It Dairy Free! Here you’ll find delicious dairy free recipes that are kid-approved along with resources you need for helping live a dairy free life! Learn more about the award-winning team behind the site. All links on our site may be affiliate links and should be treated as such. 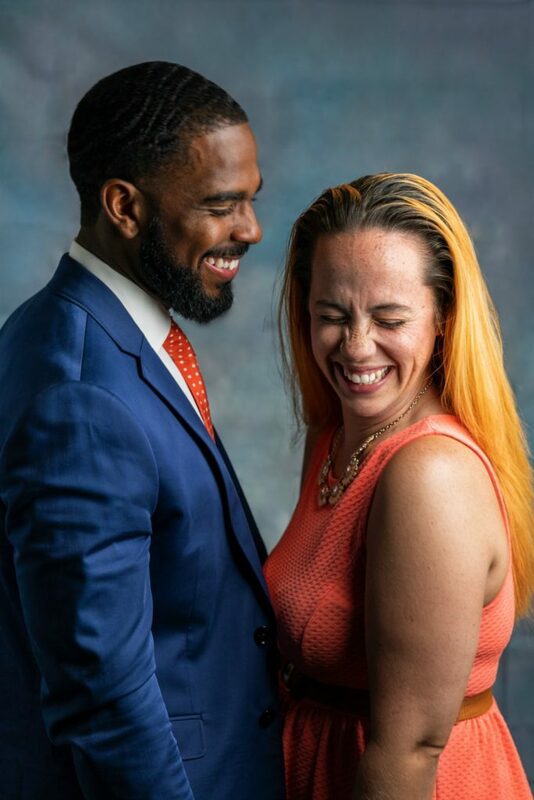 Make It Dairy Free is a participant in the Amazon Services LLC Associates Program, an affiliate advertising program designed to provide a means for sites to earn advertising fees by advertising and linking to amazon.com.